Weighty Matters: Alberta Health Services Says, "Eat A Cookie For a Good Cause"
Alberta Health Services Says, "Eat A Cookie For a Good Cause"
The Calgary Health Trust is the official fundraising arm of Alberta Health Services, and they want you to eat cookies, specifically Tim Horton's cookies, and more specifically their annual Smile campaign's cookies where $1 buys you a cookie and the proceeds go to charity. According to the information provided by Calgary Health Trust, nationally, since its inception in 1996, Tim Horton's Smile Cookie campaign has raised $3.6 million. That's $189,473 raised annually (though no doubt it's been a growing campaign). Take that number and divide by the 345 charities supported by the event and you get an average of $519 per charity per year. 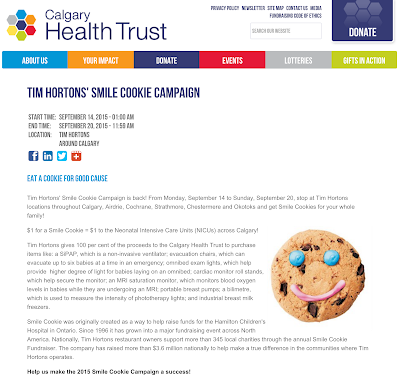 Now that said, bigger cities like Calgary are able to generate more money for their local charities because there are both more people and more Tim Horton's locations, and an email sent out by Alberta Health Services' South Health Campus hospital encouraging its health care professionals to buy and promote the sale of cookies, reports that since 2010 in Calgary the Smile Cookie campaign has raised $813,000. That's $135,500 per year. Sure sounds like a lot, but with South Health Campus' annual operating budget of $345,000,000, the cookie fundraiser covers less than 4 hours a year of the hospital's annual costs. And there are 9 other hospitals in Calgary. So is that worth it? For Tim Horton's it sure is. It buys them incredible PR, a cause beyond reproach, brand loyalty, a ridiculous and invaluable amount of social media advertising, and a hefty tax deduction that undoubtedly more than covers the cost of the cookies' flour and sugar. It also supports the concept of junk food fundraising - a concept integral to Tim Horton's outright purchase of kid sport in this country. Sure, it would require more work for Alberta Health Services to raise an additional $135,500 per year than it does to partner with Tim Horton's to sell cookies - that they choose not to make that effort is a failure of both vision and leadership.